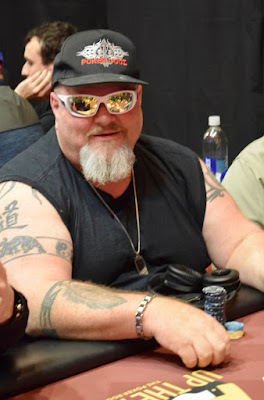 Down to 2BB, Greg @Zarrdogg White moves all in, Donna Delfin moves over the top all in and everyone else gets out of the way, including the BB who flashes Pocket_Sevens at White before mucking. Delfin showa Ace_Queen and is way ahead .... until there's a Jack in the window. The board runs out 3-4-6-2 and White is up to 5BB. He wins the next all in and is up to 12BB. At the table right behind White, Patrick Perry goes runner-runner Ace-high flush to eliminate Hafiz Khan in 24th place.